Editor’s note: Passport to Cheese is Cheese Market News’ feature series exploring the dairy industries of nations around the world. Each month this series takes an in-depth look at various nations/regions’ dairy industries with coverage of their milk and cheese statistics and key issues affecting them. The nations’ interplay with the United States also is explored. This month we are pleased to introduce our latest country — Italy. MADISON, Wis. — The history of many of Italy’s famous cheeses can be traced back close to 1,000 years or more. Gorgonzola was made in Italy’s Po Valley in 879 A.D., and Parmigiano-Reggiano wheels today are made nearly identically to how they were in 1200-1300. Traditional Italian cheeses remain popular as ever on cheese boards and in recipes around the world, while new varieties and formats continue to expand Italy’s tradition of quality cheese. Italy’s cheese exports have grown to more than 330,000 metric tons (727.5 million pounds) sold worldwide, with sales of more than 2.5 billion euros (US$2.8 billion), according to a 2015 report from the International Dairy Federation (IDF). Exports of Mozzarella and other fresh cheeses are growing the fastest, while Grana Padano and Parmigiano-Reggiano also have showed significant growth. Provolone and Gorgonzola also are growing at slightly slower but still significant levels, IDF notes. Italy’s five main export markets for cheese are France, Germany, United Kingdom (UK), United States and Switzerland. According to the Parmigiano-Reggiano Consortium, which oversees the regulation and marketing of Italy’s most famous DOP (protected designation of origin) cheese, 35 percent of the Parmigiano-Reggiano produced in 2015 — totaling 101.4 million pounds or 1.15 million wheels — was exported to international markets, the highest increase (13.2 percent) in the last decade. “The orientation of consumers towards high-quality and fully-natural products, together with the new contracts with primary retailers, as well as the education activities on product consumption carried out by the consortium, have given rise to this unprecedented growth, which is also much higher than that of many other made-in-Italy quality products,” says Riccardo Deserti, director of the Parmigiano-Reggiano Consortium. Parmigiano-Reggiano exports to the United States grew 34 percent in 2015, the consortium adds, making it the second-largest Parmigiano-Reggiano importer in the world, just behind France. “We are enamored, in love with Parmigiano-Reggiano,” says Carlo Bertozzi, whose grandfather, Abele Bertozzi, started making the cheese in Italy in 1901. Today, Abele Bertozzi SpA handles the company’s Parmigiano-Reggiano production in Italy, while Bertozzi Corp. of America, based in Norwalk, Connecticut, is responsible for exports and marketing in the United States. Carlo Bertozzi says thanks to the Parmigiano-Reggiano Consortium, which closely inspects and monitors every aspect of the cheese’s production, consumers can rest assured that the cheese is absolutely natural and of the highest quality. There are about 350 producers of Parmigiano-Reggiano and 9,000 milk producers in the cheese’s designated region of Italy, which includes the provinces of Parma, Reggio Emilia, Modena, Bologna west of the Reno River, and Mantua east of the Po River. Both the production of milk and cheese for Parmigiano-Reggiano are limited to these areas. “Some (dairies) are very small, and some are a little bigger. We source from a select number of dairies and have a long-lasting relationship with them,” says Giulia Angoscini, brand manager, Bertozzi Corp. of America. Like other DOP cheeses in Italy, Parmigiano-Reggiano wheels are subject to extensive scrutiny and must pass close inspection at each level of aging before they can be marketed with the “Parmigiano-Reggiano” seal. Photo courtesy of Atalanta Corp.
OLD FAVORITES, NEW FORMATS — Atalanta Corp. is launching a new line of traditional Italian cheeses in shredded, grated and shaved cups and exact-weight cuts. The company has seen a trend in these formats due to the ease of stocking them in the deli case. One challenge Parmigiano-Reggiano and other cheesemakers in Italy face, particularly in export markets, is competing with similar-style but less-expensive varieties from other countries. The European Union has strict rules against using the same or similar-sounding names as protected origin cheeses — for example, even the name “parmesan” is not allowed on cheeses that are produced outside the Parmigiano-Reggiano DOP region. However, outside of the EU, there is more competition with these cheeses. This week, a partnership between the Parmigiano-Reggiano Consortium and UK-based brand protection specialist NetNames was announced as an effort to strengthen and protect the Parmigiano-Reggiano trademark. NetNames will use its marketplace enforcement and website monitoring services to detect counterfeit Parmigiano-Reggiano products for sale online and subsequently work to remove websites using domain names containing the Parmigiano-Reggiano trademark. The issue of common versus protected cheese names has become a sticky issue particularly in recent trade agreements, such as the Transatlantic Trade and Investment Partnership (TTIP) currently being negotiated between the United States and EU. In March, the European Commission unveiled its TTIP negotiating proposal for agriculture and geographical indications, which included a list of more than 200 food terms the EU wants the U.S. government to protect, including feta, asiago, gorgonzola and fontina cheeses. U.S. dairy groups have consistently condemned these efforts, saying negotiators should not accept any trade agreement that does not protect common names that have been used for decades on U.S. cheeses. Traditional Italian cheeses like Parmigiano-Reggiano, Grana Padano and Pecorino remain best sellers for specialty shops and distributors in the United States. But new cheese offerings and formats from Italy also are gaining attention. Pennsylvania Macaroni Co., a third-generation owned cheese and Italian specialty food store in Pittsburgh, carries up to 100 varieties of cheeses from Italy, from the traditional classics to newer varieties. Another newer variety from Italy that is a customer favorite, Derzic says, is Fior d’Arancio — a Blue-veined cheese soaked in white wine and coated with candied orange peel. It is made by Moro Latteria di Moro Sergio in Oderzo, Italy. Cheesemaker Sergio Moro started making cheese in the early 1980s using traditional curing and aging techniques, then adding flavored ingredients to the rinds to give them unique attributes and appeal to consumers’ more sophisticated tastes. Bertozzi Corp. of America recently launched a new spreadable Italian cheese, Gran Festa, which is available in three varieties: Garlic & Herbs, Sweet Chili and Pink Peppercorn. The Gran Festa cheeses are made in Italy but only available in the United States. Angoscini notes that the company aims to market its products to foodies and those especially educated and interested in the quality and origin of their cheese. 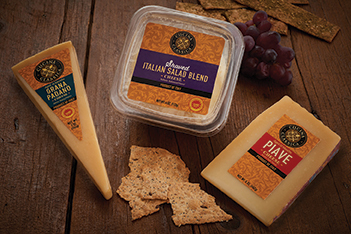 Atalanta Corp., an Elizabeth, New Jersey-based importer of Italian and other cheeses and specialty foods, is launching a line of traditional Italian cheeses in user-friendly formats under the brand Cucina Classica at the Summer Fancy Food Show next week in New York. The new brand includes a full line of Italian cheeses such as Parmigiano-Reggiano, Grana Padano, Gorgonzola and Pecorino Romano in shredded, grated and shaved cups and exact-weight cuts. Other U.S. demand trends Atalanta has observed include value-added items for healthy snacking options; more attention to natural ingredients, animal welfare and sustainable practices; and a need for more communication about the origin of and ingredients in the cheeses, as consumers — particularly millennials — are asking a lot more questions about the cheeses they buy. Bertozzi says the greater interest by consumers in authentic, natural foods will help Italian cheeses become even more in-demand in the future. “American consumers are more and more educated thanks to the Food Network and celebrity chefs, and they are looking for specialty cheeses that are imported,” Bertozzi says.